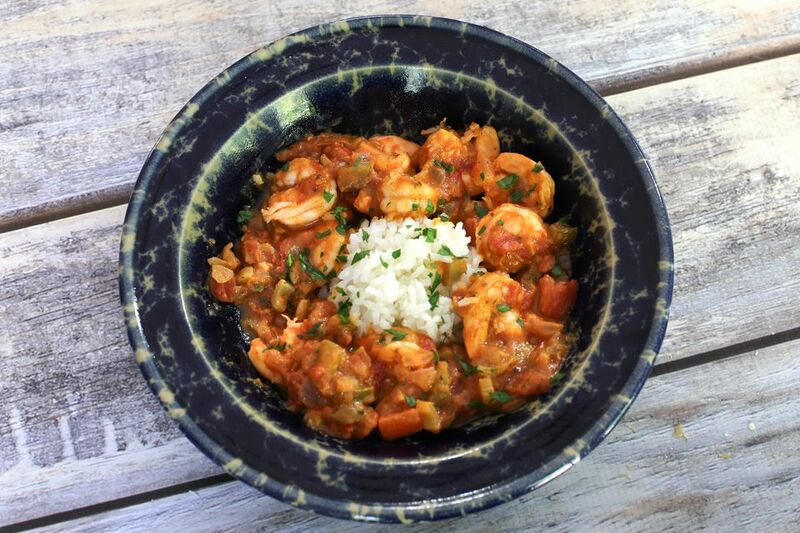 This flavorful shrimp Creole is wonderful with hot boiled rice, grits, or pasta. This version of the classic Louisiana shrimp dish is quickly cooked then frozen to bake at a later date. Heat oil in large heavy skillet. Add shrimp; cook until shrimp turns pink, stirring often. Remove shrimp from skillet. Add onion to ​the same skillet and cook until lightly browned. Stir in tomato sauce, tomatoes, bell pepper, celery, salt, garlic powder and chili powder. Simmer, uncovered, over low heat for about 10 minutes. Remove from heat and combine with shrimp; let cool. Place the shrimp mixture into 1 1/2-quart casserole that is lined with heavy duty foil, with enough overlap to cover the top of the casserole. Seal and freeze. When frozen, remove foil pack from casserole dish and return foil-wrapped meal to the freezer. When ready to cook, remove foil from frozen Creole and slip Creole into the casserole in which it was frozen. Cover with foil and bake 1 hour in a preheated 400 F oven.